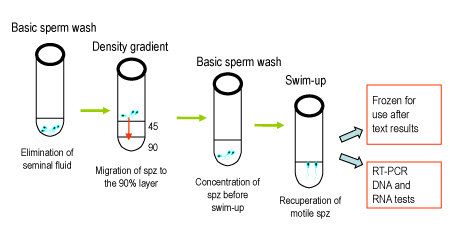 Sperm preparation for HIV seropositive patients. With the long proven efficacy of antiretroviral treatments on HIV, it is now possible for carriers of this virus to envisage conceiving a healthy child. A “sperm washing” technique and an assessment of the viral burden have been developed for HIV carriers. It consists of a double preparation of the sperm as explained in the diagram below. Thanks to this technique, none of the babies born after sperm washing have been contaminated.